Once upon a time she went heli-skiing and skydiving* and scuba diving. These days she goes to the park and ‘Gymbaroo’ and sings ‘I’m a Little Cuckoo Clock’ at swimming lessons. She has discovered that the adrenaline burst you experience from jumping out of a plane is remarkably similar to the one you get when your toddler makes a run for it in a busy car park. From website. Full bio can be found here. The Husband’s Secret, which has already been on Entertainment Weekly's Must Read list, totally lived up to its reputation. This book follows a week in the life of three different women, who are all connected in small ways. One women is betrayed by her best friend and husband and finds herself involved in an affair with an ex-boyfriend. Another woman lost her daughter in an unsolved murder and has never recovered. The third woman finds a letter her husband wrote her to open in the event of his death that contains a life-shattering secret. I was very impressed with Moriarty’s writing. She was excellent at weaving these women’s lives together. The Husband's Secret sucked me in immediately. I couldn’t put it down because I had to find out what was going to happen next. She did a great job of revealing everything at the right pace so that there were no boring parts. I really felt for these women who on top of dealing with all the regular problems had horrible things thrown at them, interrupting their life. I can’t imagine what I would do in their situations. Moriarty really made you feel connected to their thoughts and decisions. 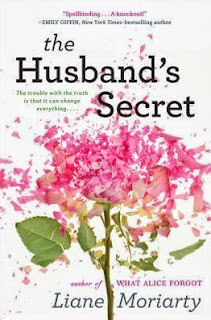 The Husband's Secret was kind of a fluffy book. If it was a movie, it would be a chick flick. BUT, it is nice to read something every once in a while that has a wrapped up, happy ending. I really enjoyed this book. It was a fast and interesting read.